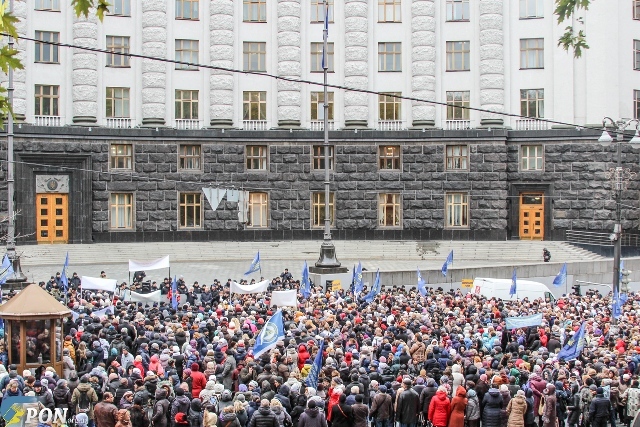 On 1 November 2016, teachers of the capital organised picketing of the Cabinet of Ministers of Ukraine and the Verkhovna Rada of Ukraine protesting against the high tariffs for housing and utility services. The picketing was initiated by the Kyiv City Organisation of Education and Science Workers’ of Ukraine. All the territorial organisations of the Education and Science Workers’ of Ukraine from all over Ukraine together with students of leading schools, generally about 15,000 people, participated in the picketing. Raising housing and utility tariffs became for teachers true ‘draconian tariffs’, and the initiative of the Government to increase the minimum wage are humiliating educational sector workers whose wages are linked to the 1st wage category that remained at the same level. The teachers say that the intention of the Government to raise the minimum wage twice is a positive step; however, the pay reform cannot be implemented without unfreezing the entire Unified Rate Schedule. In addition, the Union stressed that the teachers are not beggars and do not have to stand in queues for subsidies. The subsidies have to be allocated to the low-income households, unable to work groups: pensioners, persons who cannot provide themselves with work, single mothers, etc. Moreover, they, as qualified workers, should not become hostage to ultra-high tariffs for housing and utility services. The wages should allow the workers to satisfy the needs of their families rather than force ask for help from the state. The participants outlined their demands to the Government and the Parliament in the Resolution.